The 19th century brought significant technical advances over what was available for the previous transit of 1769, particularly in the areas of telescope construction, photography, clocks and the determination of global position, particularly longitude. The attempts to calculate the solar parallax from the transits observations of the 18th century showed significant scatter. Consequently, considerable efforts by astronomers from a dozen countries worldwide were made to observe this transit with greater accuracy. For example, astronomers from the United States went to Vladivostok, Nagasaki and Peking in the northern hemisphere as well as Kerguelen Island, Hobart and Campbelltown in Tasmania, Queenstown in New Zealand and the Chatham Islands in the southern hemisphere. British astronomers went to Cairo, Rodriguez Island, Christchurch, Kerguelen Island, Honolulu, and Mauritius. Many observations were made from across Russia and French observers went to Saigon, Peking, Nagasaki, Campbell Island, St. Paul Island and Noumea. Results from British observers suggested a solar parallax of between 8.75 and 8.88 arcseconds. 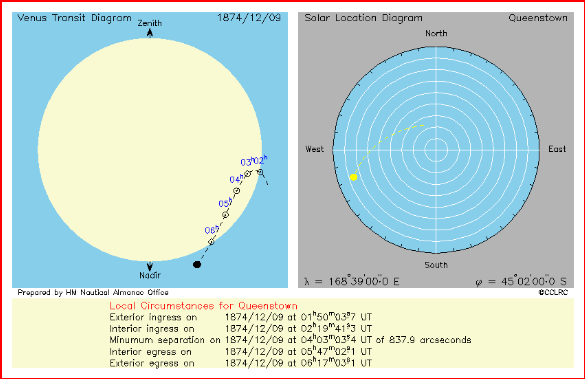 Venus crossed the disc of the Sun on 1874 December 9th. The map above shows the visibility of the event. The entire transit was seen from Australasia and the western Pacific Ocean, Japan, Central Asia and the Indian subcontinent. The Sun set during the transit in the grey area encompassing the central Pacific Ocean and western Siberia. The Sun rose while the transit was in progress in the grey area taking in Africa except the western part, western Asia and eastern Europe. The yellow lines on the diagram show the position of the terminator, where the Sun is either rising or setting, at the key phases of the transit. The geocentric circumstances of the transit are shown in the diagram above. During the transit, the diameter of the Sun was 1949.2 arcseconds and that of Venus was 63.1 arcseconds. In other words, the diameter of Venus was 0.03 that of the Sun, making it look like a rapidly moving sunspot. The whole transit lasted just over four and half hours. Local time in New Zealand is 12 hours ahead of Universal Time. In Queenstown, the transit began with exterior ingress at 01h50m (UT). Venus took 30 minutes to cross the limb with interior ingress occurring at 02h20m (UT). Venus reached its minimum separation of 837.9 arcseconds from the centre of the solar disc at 04h03m (UT). Interior egress occurred at 05h47m (UT). Venus took 30 minutes to cross the limb of the Sun for the second time with exterior egress occurring at 06h17m (UT). The progress of the transit is summarized in the diagram below. The left-hand panel shows the movement of the Venus across the solar disc. The top of the diagram points to the zenith, the point directly overhead. The position of Venus is marked every UT hour. The right hand panel shows the movement of the Sun in the sky. At the beginning of the transit, the Sun was north north west at an altitude of 63°. By the end of the transit, the Sun was in the west at an altitude of 20°. Sunset occurred at 08h23m (UT).